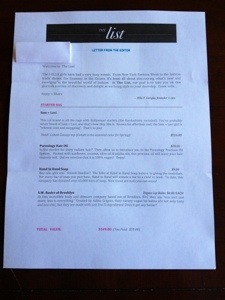 “The List” is a monthly fashion subscription started by i-Ella. After completing a style profile that includes general style as well as dress, top, pants and shoe sizes, they will send you a gift bag containing 4-6 of the most coveted designer brands and free stuff. They currently have three different price points: “The Starter Bag” – $59.00, “The Soho Bag” – $129.00 and “The St. Barth’s Bag” – $389.00. WooHoo! 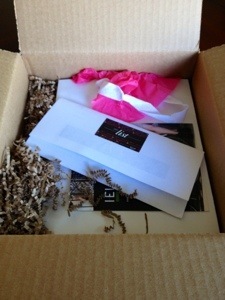 My First i-Ella Gift Bag is Here!! 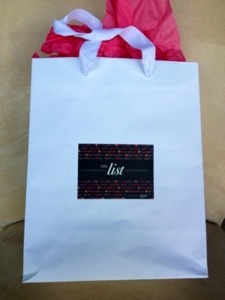 Everything is nicely packaged in a gift bag! 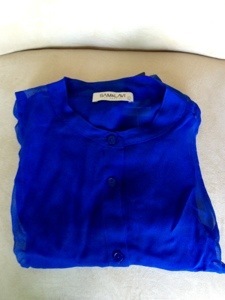 This is a nice sheer, sleeveless top in a vibrant Cobalt Blue! It will be perfect for spring and summer! This is a triple milled Shea butter soap that smells delightful and I can’t wait to try it! 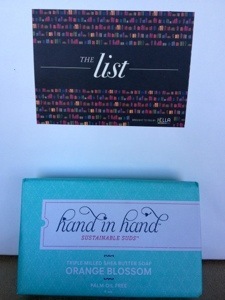 I also like that Hand in Hand donates at bar to a child in need for every bar purchased. I am excited to try this and hope it works well. I already use pequi oil and have recently received some argan oil but all of those bottles are much smaller than this one. 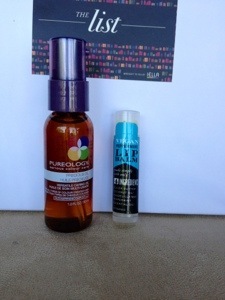 In these dry winter months one can always use more lip balm, vegan and organic are definite bonuses! I am so interested in trying this. Hmmmm . . . .